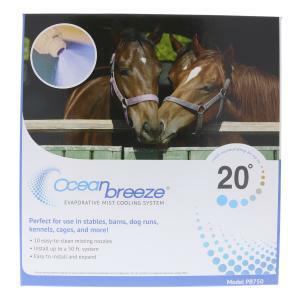 Ocean Breeze Kits are great for kennels or horses and other farm animals. Provides a cooler, healthier environment for horses, cows, hogs, and poultry. The fine mist will evaporate instantly leaving no standing water. Use this in stables, corrals, barns, hog houses and chicken coops. To create your own Micro Climate, simply attach an Ocean Breeze Evaporative Mist Cooling System to any convenient faucet. Turn on the water and enjoy the cooling comfort of and Ocean Breeze. By increasing the moisture content of the surrounding air, and the immediate evaporation of the mist, the Ocean Breeze Evaporative Mist Cooling System can dramatically reduce the air temperature. The hotter and drier the air, the more noticeable the cooling effect. For best results, mist heads should be installed with heads facing the area to be cooled.